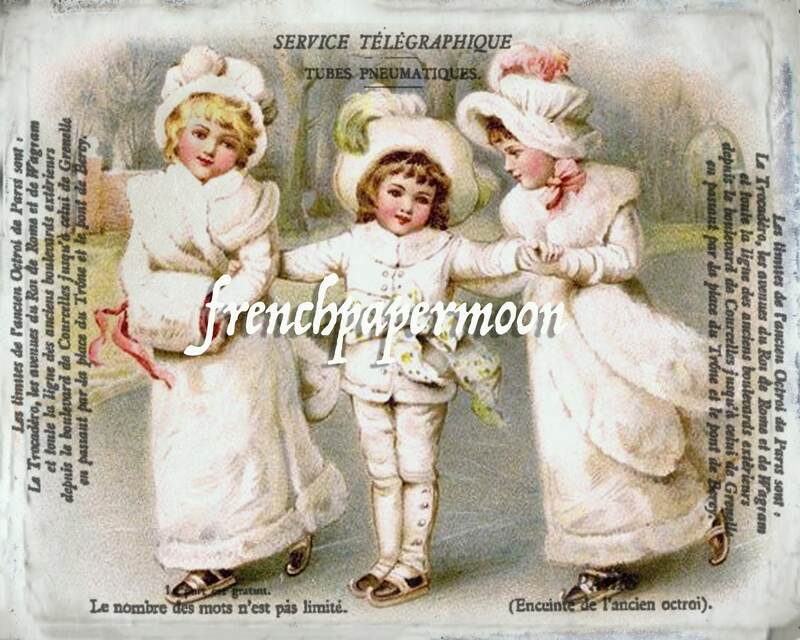 Adorable victorian children ice-skating with French graphics. You will receive 2, 8x10" JPEG images, on reversed. 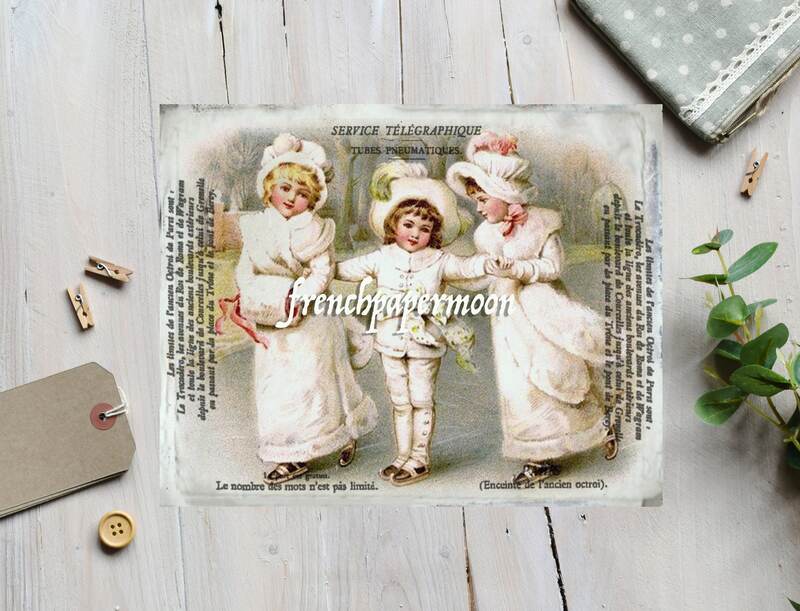 All French Paper Moon downloadable graphic art items are high-resolution 300 dpi (dots per inch) for crisp, clear, colorful printing. It is recommended that printing be done using quality photo printing materials. As computer screen resolutions and printer settings vary, printed color tones may vary from what is shown here. All Images, Materials, Content and Form contained within listings, products, and materials are the intellectual property of FrenchPaperMoon. "Images by FrenchPaperMoon - Etsy" in the description of each such item and link to my shop: www.frenchpapermoon.etsy.com. Because of the nature of the product, refunds and exchanges cannot be issued. I want to be happy with your purchase. So, if for any reason you feel that the product you've received is not what you were expecting, please contact me and I will do my best to correct it. Selling of the images as they are in large size, is not allowed. You CAN incorporate my images in your own craft and art items. You CAN sell finished tangible items made by you (EXCEPT printed paper sheets) on Etsy or other virtual shops, craft and art fairs. You CAN sell the items made by you in a small commercial quantity (up to 150 times each item). For use more than 150 times please purchase the commercial use license. You CAN re-print the items as many times as you need for your personal use. You can make gifts for your friends and family as many times as you want! You CANNOT Resell my Digital images (Purchase doesn't transfer copyright!). You CANNOT Sell printed paper sheets (or transfer paper sheets) of my images (whole sheet or part of it). You CANNOT Use any part, or the entire sheet, to put into your own digital collage sheet. You CANNOT Incorporate any parts of my design in your digital designs and banners and sell it. You CANNOT Exhibit the digital images you purchased as they are at any personal virtual shop. You CANNOT Sell my designs, printed or digital, as a part of Scrap-booking Kits. You CANNOT Share purchased files with other people. File sharing is forbidden! (You can refer your friends to my shop). You CANNOT Make Supply Stuff based on my images and sell it. You CANNOT Mass reproduce (The large-scale manufacturing and the wholesale production). You CANNOT Resell or give away my digital images on CD or any other way.